I have run several DARE activity days using ROCKUP and have always been impressed with the professionalism in the delivery of their programs. The Children were all challenged & totally captivated by the activities & the activities fit the DARE ideals in everyway. The children all learnt a lot about themselves & each other by practically applying the theory they learnt in the classroom. The addition of ROCKUP’s activity based learning programmes to our DARE programs has proved to be invaluable towards getting the message across. The teachers, principals, students and parents raved about ROCKUP & have requested we provide ROCKUP again as part of our DARE Programs. Would you like the opportunity to offer your students & colleagues exciting, engaging & fun activity days that generate & encourage team work, develop life skills, teach behavioural learning intiatives & goal setting? ROCKUP's facilitated interactive programs, enhance overall well being, attitudes, confidence & self esteem with a safe, controlled operational environment. ROCKUP's formatted programs are designed to fully engage students & encourage team work.
" Teachers can sit back & observe the program or join in for some ROCKUP FUN " ... to develop a closer rapport with their students. ROCKUP " delivers mountains to you" or your school, just choose from over 50 adventure based learning activities including rockclimbing, archery, raft & bivouac building, a wide range of team tasking exercises all facilitated by qualified instructors who are responsible, friendly role models. 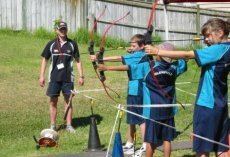 Would you like to offer students professional Archery lessons ? ROCKUP offers trained Archery Instructors with all equipment - Bows: (Recurve adult 20lb or youth 15lb), Arrows: 28 inch fibreglass with coloured fletches. You can hire up to 6 Stands including a 6x3m Ezyup Shelter or 4x4 Airbarn for 2 to 3 Stands complete with trained Instructor & 1100x800mm targets per stand. A great way to encourage life skills to develop responsibility, listening and consequence for action strategies with positive goal focused learning. Do your students need a reality check or assistance with consequences for action development ? ROCKUP offers professional Shooting Lessons with quality equipment - CO2 8-shot Beretta Pistols, Air Rifles with scopes, .22 Rifles or 12g shotguns dependent upon Venue or area of use. 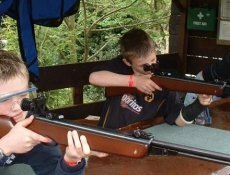 You can hire up2 to 6 Stands including a 6x3m Ezyup Shelter or a 4x4 Airbarn for 2 to 3 Stands complete with a qualified Instructor and selection of targets. A great way to encourage confidence to develop Responsibility, Listening and consequence for action skills. Would you like to help students develop, self esteem, confidence, trust, teamwork, safety awareness & positive behavioural learning? ROCKUP's most exciting & popular program is the Rock-climbing Wall. 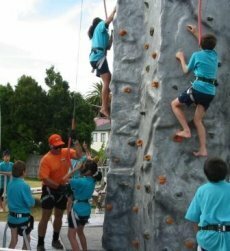 The unique ROCKUP systems with the 8m high, full autobelay rockwalls all operate with 4 climbers at a time, in wet or dry conditions partially due to the use of the inflatable classrooms (AIRBARNs). The programs utilize, buddy networking, interactive teamwork & safety via harnessing, development of climbing & abseiling techniques with ongoing positive growth of self esteem. ROCKUPs combination of a quality, structured, instructed process with encouraged repeated achievement, culminates in the excitement from a shared comraderie of conquering fear that crosses all boundaries. ROCKUP over the last 5 years has developed a very successful Road Safety Program with the rockwall. The use of the unique 3 Buckle Harness...ensures the BUCKLE-UP Stay Safe message is a natural component with a wide range of other very important road awareness, driving and life messages that with the full VAK impact guarantee success. Do your students need to develop hands on construction & life skills? ROCKUP provides all the equipment with a trained Instructor and full VAK process. 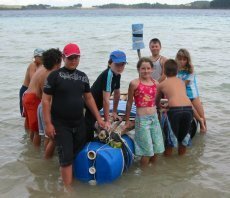 A great way to encourage life skills, rope and construction techniques that develop confidence, responsibility, listening and consequence for action strategies. The achievement of teamwork, design, proper use of materials or recognition of environmental factors can be by far the greatest way for a lesson to stick for a lifetime... only in our scenarios the danger is perceived rather than real and the environment a controlled one. However the positive team and skill based learning is huge and great FUN is shared by all...wet or dry. 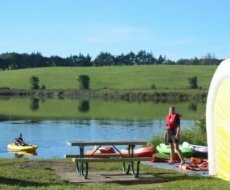 Do you want to hire kayak equipment with trained instructors to enable safe skill based & positive learning ? ROCKUP offers this safely with the opportunity to incorporate a wide range of direct messages. 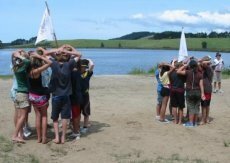 ROCKUP Programs can be operated at a camp venue, public park, onsite at school or even a private farm. ROCKUP has access to a wide range of venues & options to create solutions that can fit almost any budget. 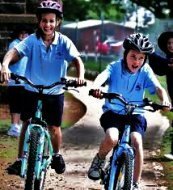 Do you want to hire cycling equipment with trained instructors to enable safe skill based & positive learning ? Would you like a reward based multi tasked, learning activity for teamwork, following instructions & environmental awareness ? ROCKUP creates and customises formatted tasking activities that will challenge and excite students whilst maintaining a safe & fun environment. ROCKUP is only one of the few outdoor adventure businesses in NZ that can deliver safe, comprehensive outdoor based programs NZ wide. Do you want to use a wide range of activities to keep 60 to 160 Student fully engaged for a whole day? ROCKUP TOP TEAM DAYs are a fun & challenging way to get students working together towards a common goal & incorporate different challenges. TOP TEAM Creates comraderie & team work, leadership, change & growth, attitude & focus ... a great way to totally engage all your students for the day ROCKUP to ROCKUP & Climb On!! 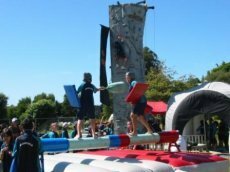 Rock-climb, Volcano Adventure Obstacle Run & Slide, Archery, Ski-Boards, Giant Earth Balls, Katipo Webs, Giant Rubic Cubes, Cycling, Kayaks, Dunking Tank, Log Jousting & Horizontal Bungy Rugby.